Jeans and denim are without a doubt, some of the thickest fabric you can find. Out of curiosity, you may be thinking of what is the best sewing machine for jeans and denim. This article will guide you through identifying which product tops the list when it comes to sewing machines for jeans and denim. We will discuss and review products, as well as include some of the need to know information about sewing machines. Out of all the sewing machines we have looked into, the Janome DC 2014 comes in on the top our list as the overall best sewing machine for jeans and denim. Janome has always been a trusted company and has produced outstanding machines over the years. We picked this product as the overall best based on its key features, the quality of its stitching, and because it is so easy to use. This product creates high-quality output, but offer easy to learn operation that even a beginner can quickly learn. 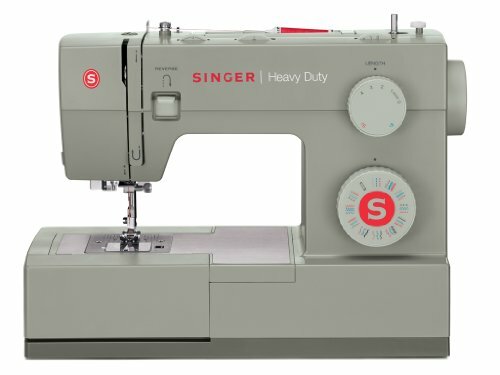 It is a very versatile and dependable machine that can help you with both light sewing as well as projects that require heavy duty sewing. Computerized and showcases different colors for every model released annually, it also has a very sturdy body that can guarantee that it will last longer. One of the key features that this product offer is that it has 50 built-in stitches. If you are a beginner, you can have a view of what each type of stitching looks like from the illustration located in front of the machine itself. This allows the user to have an idea of what every stitch look like, and what specific presser foot is required for it. You can easily select which type of stitching best suits the project you are working on. This is definitely an excellent feature for a sewing machine to have. You can do just about any type of sewing project with the variety of stitches this machine offers. With this machine, you can easily do utility, stretch, quilting, garment, and applique to name a few. 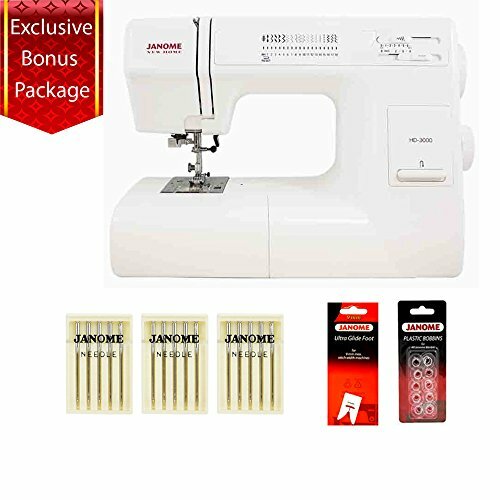 Another key feature that makes this product the ideal sewing machine for all sewing projects is that it offers 6 different types of presser foot. In general, a regular sewing machine carries the normal presser foot, but this machine is nothing close to ordinary. Each of its presser foot can be easily snapped on and can be used depending on which type of stitch you want. Foot F (satin stitch) – used for satin stitches or for decorative stitches, this specific foot has a beveled bottom to ensure a smooth feed of the thread. Foot E (zipper) – this presser foot is appropriately named and used to sew in zippers. Foot R (automatic buttonhole 9mm) – this a remarkable foot that acts as a sensor and creates the exact buttonhole size for whichever button you are using. And the machine does this automatically. Placing the button at the slot located at the back of the presser foot allows it to determine that right size and proceeds to create the buttonhole. Foot C (overedge) – Foot C is used to creating an overcasting stitch for the edges of the fabric. Foot G (blind hem) – this foot has three grooves found on its underside and a metal guide located on its center. Used when doing blind hems, the fabric’s fold rests on the guide while the grooves keep it from slipping. Foot O (¼ inch seam) – Foot O acts as a guide for you to be able to create the perfect ¼ inch seam every time a project requires for it. Even feed presser foot – this foot works excellent when doing a top stitch. Also known as the walking foot, the even feed presser foot is equipped with a set of teeth called feed dogs. This allows uninterrupted feed of the fabric. 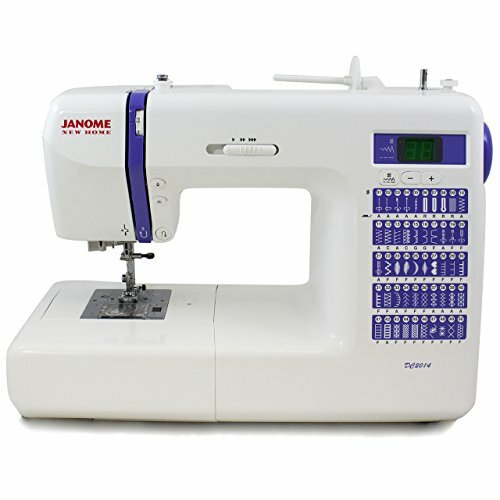 Another outstanding product made by Janome is the HD 3000 heavy duty sewing machine. Its all-white design is elegant and pleasing to the eyes. However, it may seem delicate; it has a tough and sturdy body that guarantees durability. This product is very user-friendly that suit even the user without much sewing experience. A clean and easy to use interface is mainly responsible for this. Apart from that, it also offers 18 built-in stitches and can sew through all types of fabrics. This is why we picked it to be the best sewing machine that you can opt for hemming jeans. This product allows any fabric to glide through which includes hemming jeans. This product comes with a wide range of different types of stitches that are already built into it. You can just easily choose a specific setting for the type of stitching you want to use on your project. With different types of stitching to choose from. Selecting the one you want to use is made easy with a dial knob. For every type of stitching, you can also choose from the 5 types of presser foot suitable for it. Each presser foot can be snapped on and taken off with ease. This special feature allows you to adjust the pressure of the presser foot. This plays an important role, especially when you are sewing through thick fabrics and fabrics with multiple layers. Threading needle can be a bit of a hassle, especially if you don’t have the perfect vision. This product makes this task easy for you since it has an auto needle threader function. One of the notable features of this product is that it has a maximum speed of 1100 SPM (stitches per minute). And it does it accurately even with thick fabrics like jeans and leather. With the absence of electronic buttons, this sewing machine is purely mechanical, but still offers 23 different types of stitches. It has a metal body that just goes to show how sturdy it is. It also houses an outstanding strong motor and has a presser foot the lifts extra high. Additionally, it also has a bedplate that is stainless steel and a drop-in bobbin for the user’s convenience. It may be a mechanical type of sewing machine, but this product offers 23 built-in stitches to choose from. You take advantage of the wide range to stitching selection depending on the project you will take on. This product also comes with a dial knob for you to select which type of stitching works best for your sewing project. It has 4 types of presser foot that you can choose from to fit the type of stitching you desire. To accommodate thick fabrics like jeans and denim as well as leather, it is equipped with a presser foot that has an extra high lift. What Are The Top Features Of A Sewing Machine for Jeans and Denim? We have listed down the top features that a sewing machine for jeans and denim should have. A machine that is expected to perform remarkably every time must be equipped with a powerful motor. This serves as the heart of the machine. How robust the motor results to how effectively the sewing machine sews through any type of fabric. The more powerful the motor is, the more effective it is when handling even the thickest of fabrics. Since we are focused on jeans and denim as the type of fabric, your machine should have a heavy-duty motor. The leveling button may seem to be a tiny button and is often an overlooked part of a sewing machine. However, this little button is as important as every other part of the machine for it to perform excellently. Found on the presser foot; the main purpose of the leveling button is to lift the presser foot’s front end. This allows the sewer to insert thick fabrics under the presser foot to proceed with the sewing process. The same logic applies when there is a need to sew through multiple layers of fabrics. Sewing through thick fabric means there should be enough space under the presser foot to accommodate it. This is the reason why one of the key features you should look for is a presser foot the has an extra high lift. This function will ensure that your machine will be able to sew through thick fabrics as well as multiple layers of fabrics. Having this specific feature means your machine is highly able to sew through jeans and denim. A heavy duty sewing machine is also expected to last long. It may have all the features mentioned above, but without a durable body, all of it can go to waste. Most machines are made from durable material such as metal to ensure that can last long. An all-metal machine is strong and sturdy enough to go a large workload of sewing. What is the most difficult aspect of learning when it comes to sewing? Identifying which is the most difficult aspect to learn when it comes to sewing may vary from person to person. In actuality, the degree in difficulty depends on the person. Be that as it may, most people that are learning how to sew find it most challenging to choose and create the right pattern to use for sewing. In terms of the sewing table, what is the recommended height? As for the sewing table, there is no definite height required for it. The reason for this is that you need to consider the convenience and comfort level of the user. The height of the sewing table should mainly be based on the height of the user. However, we would advise that in choosing for one, make sure that it is at elbow height and also keeps the wrist at a straight angle while working. Is it important to oil a sewing machine? As part of regular maintenance and also to ensure that your sewing machine will last long, applying oil on it is important. Oil should be regularly applied to its part for friction reduction. A well-maintained machine also has high chances of performing excellently with every use. How do you properly operate the presser foot? To operate the presser foot, locate the presser foot lifter which a lever attached to the presser foot. It is often found at its back or sometimes on its side. The location may vary depending on the model or brand of the machine. Using this lever will allow you to lift up and press down the presser foot. Since jeans and denim are thick fabrics, can a regular sewing machine work on them? A regular home sewing machine can also be used to sew through jeans and denim. However, we would like to advise you that in doing so you will need to use it a slowly and carefully as possible. Jeans and denim are thick fabrics, but when equipped with the appropriate needle; a regular sewing machine can do the job. For sewing jeans and denim, what is the best needle to use? As a general rule, the needle size suitable for sewing through heavy fabrics such as upholstery fabrics, curtain, tweeds, jeans, denim is 16/100. What should I do when my sewing machine skips stitches? When you encounter a machine that skips stitches, this could mean that there is an issue with the needle. Check if your needle is bent as this is one of the most common reasons why your machine to skip stitches. Other issues like the needle not inserted properly into the needle shaft as well as using the inappropriate type and size of the needle. To summarize, there are a number of outstanding products that can be considered that best sewing machine for jeans and denim. However, we recommend the Janome DC 2014 as our overall top pick for this category. This product offers a lot of notable features which includes 50 built-in stitches, 6 types of presser foot, and a max speed of 860 spm to name a few. This product also sews through any kind of fabric, even the thick and heavy ones. In choosing the right sewing machine, you need to look into the key features that the product offers. This will help you in making the best decision.